If you are a history/old house nut like myself, when you start tearing into your century-plus year old house, you hope you find SOMETHING. 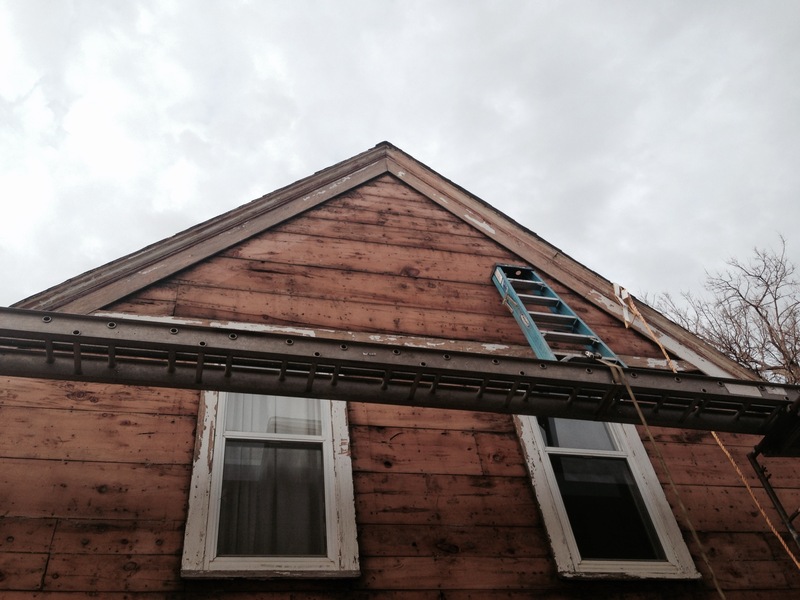 As our exterior siding replacement draws to a close, I will share what we found. “H.C.M” In decorative block letters. How. Amazing. Is. That. Someone, working up near the peak of our roof, decided to pull out his slate pencil, and write his initials. He didn’t stop there. He made them fancy. He knew, I am sure, that some day, someone from a world he could only imagine, would take in those initials and wonder who had written them. And that person was me. What a gift to feel that kind of connection with the past. If only I could find out who H.C.M. was. “farbandede” is how I read it. I sat in the dentist’s waiting room while my kids got the checkup and consulted google and facebook for answers. arbandede is what it looks like to me. ME: Or maybe Lar ban Dede? Dede is a last name… There are Dedes in Sioux Falls…?? ME:So I found that “forbandede” means “cursed” in Danish…. Which seems even creepier. ME: Now I’m ticked at the Danish guy who wrote that on my house. Haha… Thanks for nothing, Google. SMART FRIEND: Is it where the original color would have changed? Farbanderle is Swedish for other color. ME: This is so interesting! Now I see that what I thought was a “d” could be a “r l.” Yes, it is possible that that is what it was referring to. This part of the house was originally green and below it was grey. Love it! THANK GOD IT’S NOT A CURSE. And so, just like that, I took a sigh of relief that my house was NOT cursed. A Swedish carpenter had just written instructions to his crew, or maybe just to himself to remember to change the color of the siding at that point. Not nearly as dramatic, but sill so crazy cool to lay eyes on that script, put there 126 years ago. Find #3: Our contractor said that there were what looked like old tuna cans nailed into the sheeting on the roof to cover knots in the wood. Nice insight. It makes sense…Swedes like fish, right? Find #4: When the tuck-pointers cleared out stuff from under the porch, they found this old Canada-Dry bottle, circa the 50s/ 60s. I learned from the women, who used to be girls in the house during that time, that they used to by these bottles of ginger-ale for a dime from a nearby store. The bottle I will keep in the house with all of the other trinkets we’ve found. The writing on the wall was covered up with the new siding and I imagine will remain unseen for anther 100 + years. I don’t know who it was who put it there in the first place, but I’m glad he decided all of those years ago, to give this girl a thrill. I always enjoy finding old writing on our house too. The bottom of a tread on our stairs have the original builder’s company name and our address on it. I’m pretty sure it must have been the bundle, and labeled at the lumberyard for delivery. I leave behind my own fair share of writing, but it’s usually boring stuff like dimensions, “up”, or “outside”, haha.